Home|Napudet hills and student research projects! Ryan and Morgan at the Napudet Hills (photo credit: Dorien de Vries). 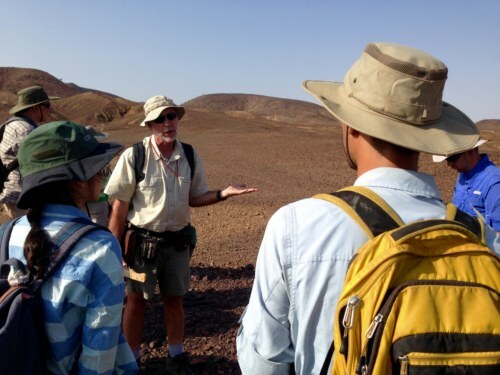 Dr. Craig Feibel talks about the geological setting of the Miocene deposits in the Napudet Hills (photo credit: Dorien de Vries). Last Sunday, the students joined another group of visitors (part of the Academic Safari program hosted by TBI) and drove to the Napudet Hills. These hills contain some middle Miocene fossiliferous deposits (roughly around 13 million years ago), as well as some later Plio-Pleistocene deposits (covering a range from about 4 to 2 million years ago). 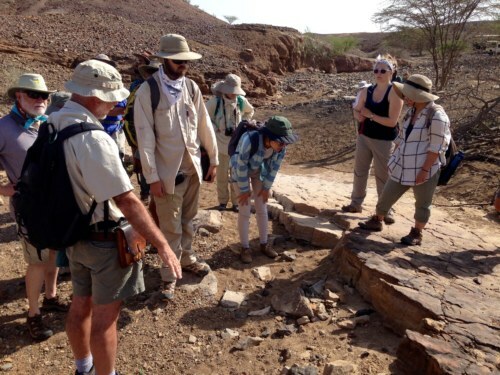 Some exciting fossils have been found here, and we were guided through these different deposits by Dr. Craig Feibel. 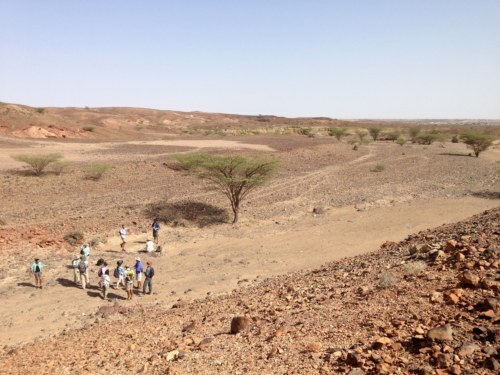 We started in the Miocene deposits, which mainly consisted of volcanic ash and basalt flows. 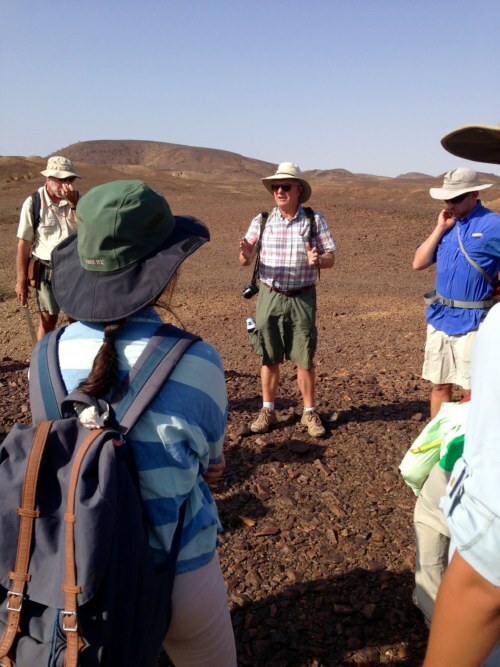 Dr. Lawrence Martin talks about the important fossils from Napudet Hills (photo credit: Dorien de Vries). 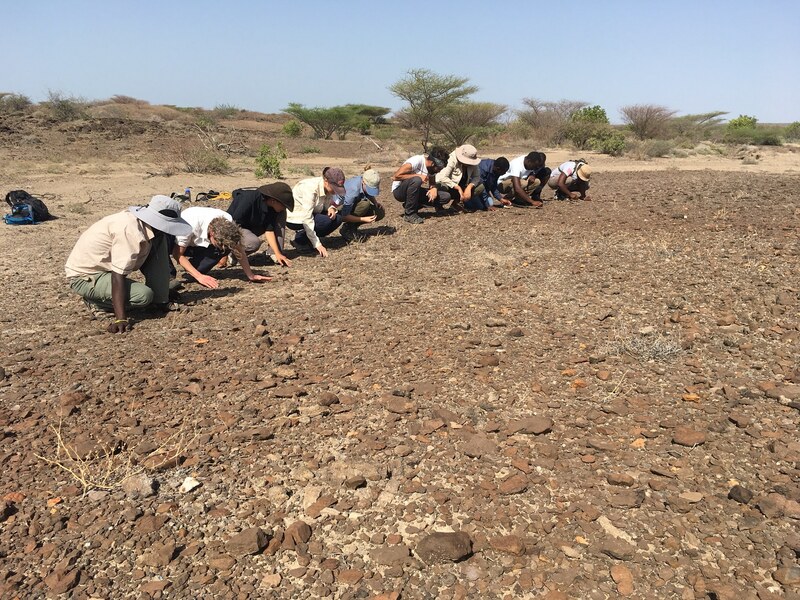 Students look at some rocks from the Napudet Hills (photo credit: Dorien de Vries). Petra and Adrianne at Napudet Hills (photo credit: Dorien de Vries). 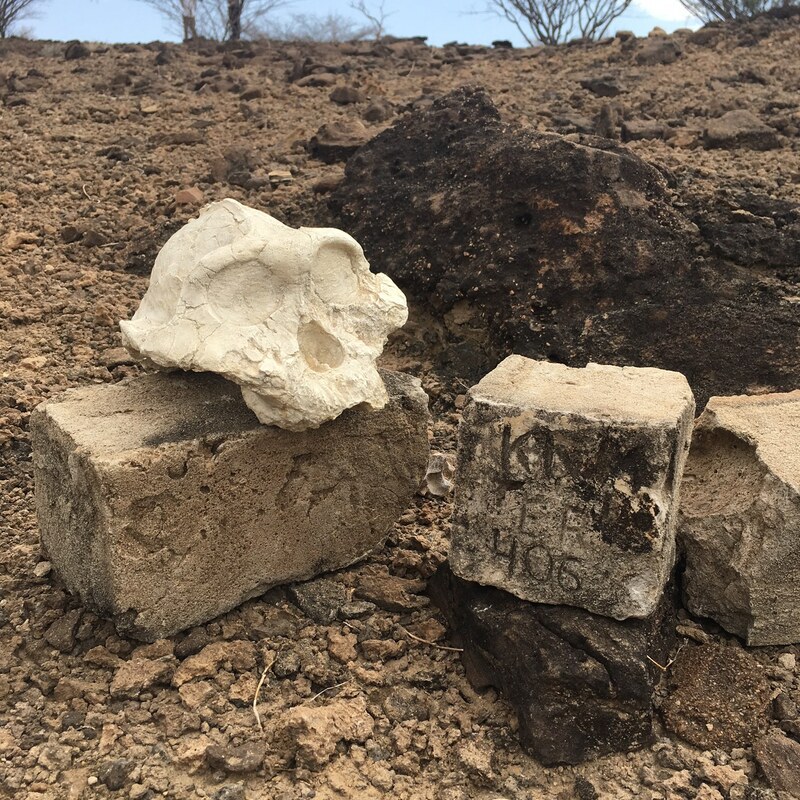 There were also some fossilized tree trunks present that illustrated how different the environments were in the past from the hot and dry expanse that the Napudet Hills are today. 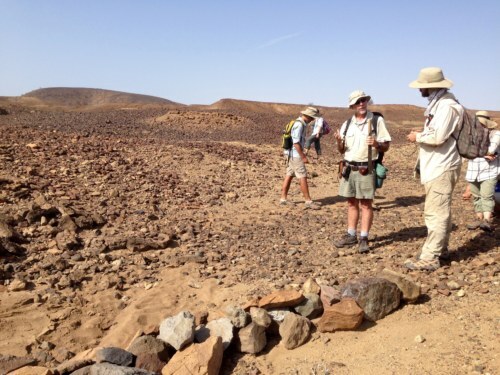 We then walked through a dry river bed through geological time from the Miocene to the Plio-Pleistocene. The deposits changed markedly in appearance, from harder basalt layers to softer pinkish layers. Dr. Feibel showed us the lacustrine nature of these sediment layers, and explained the environmental setting of the Napudet Hills and similar sites from the Plio-Pleistocene nearby. Dr. Craig Feibel points out different sediment layers at Napudet Hills (photo credit: Dorien de Vries). 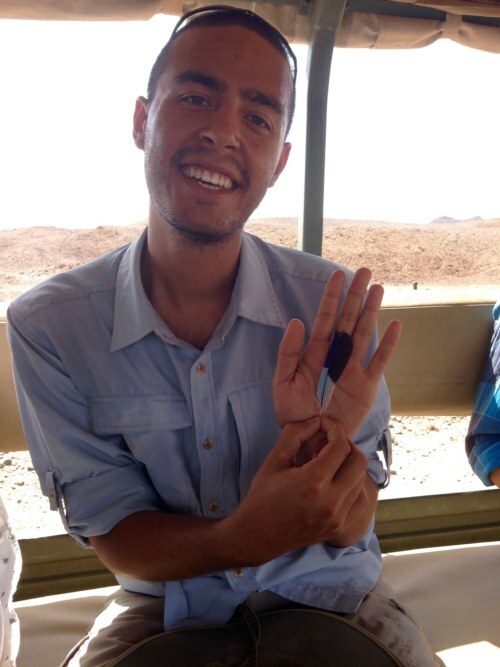 Ryan found a beautiful feather (photo credit: Dorien de Vries). 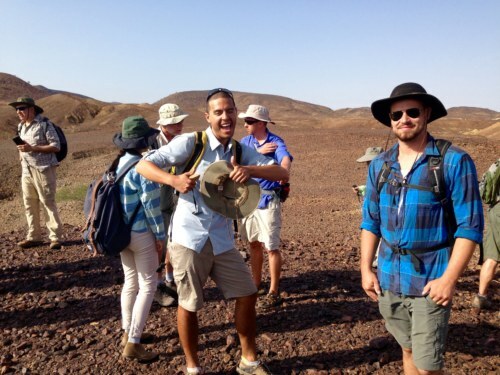 Students walking from the Miocene to the Plio-Pleistocene deposits at Napudet Hills (photo credit: Dorien de Vries). 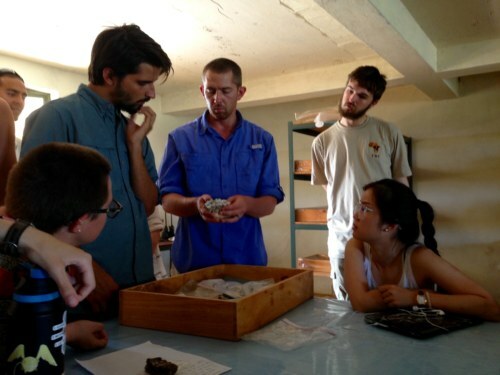 Dr. Craig Feibel and Nate discuss the geology of a fossil site at Napudet Hills (photo credit: Dorien de Vries). In the afternoon, the students were fortunate enough to hear a lecture from Meave Leakey about her family’s discovery of the Nariokotome Boy skeleton in the 1980s. Nariokotome Boy is the most complete fossil ever discovered of African Homo erectus. Hearing from Meave herself was a phenomenal experience. 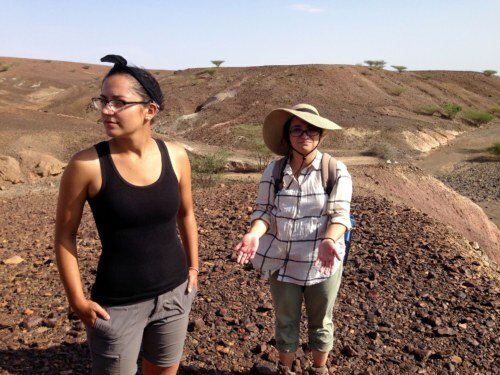 After hearing her speak about the day-to-day life while on the excavation, we had a lively Q-and-A session about how the fossil fits in with more contemporary understandings of hominin evolution. 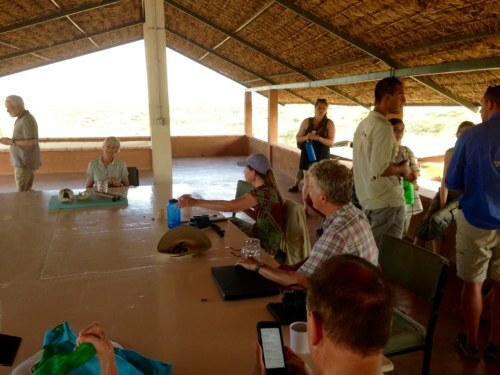 Dr. Meave Leakey gives a lecture on the discovery of the Nariokotome Boy (photo credit: Dorien de Vries). As far as classwork, the students have started on new research projects in palaeoanthropology. 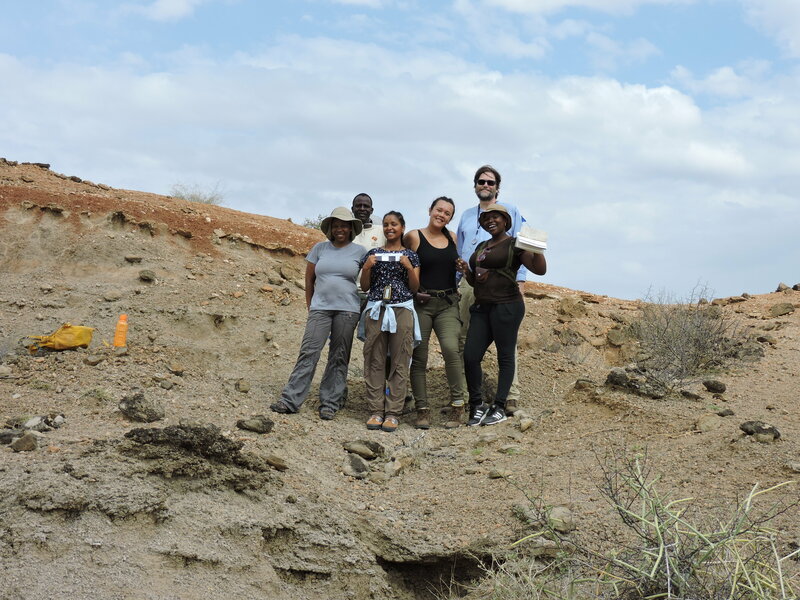 Dr. Jason Lewis introduced the students to three research projects that all relate to reconstructing the paleoenvironments of different hominin sites in Kenya. 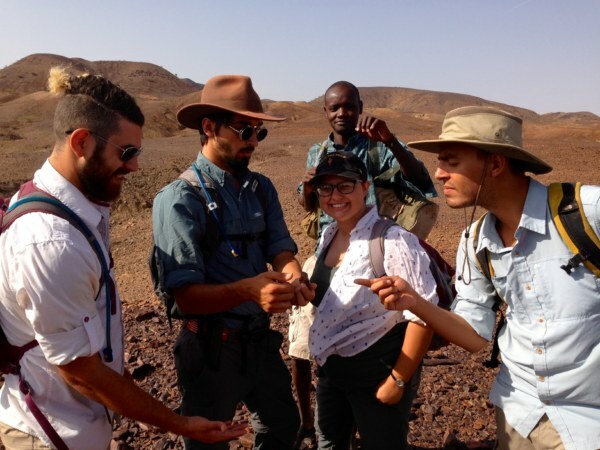 Dr. Lewis introduced the students to the different methods they will be using to examine specific aspects of faunal assemblages, and how these data will feed into helping to answer larger questions of climate change, paleoenvironments, and hominin evolution. 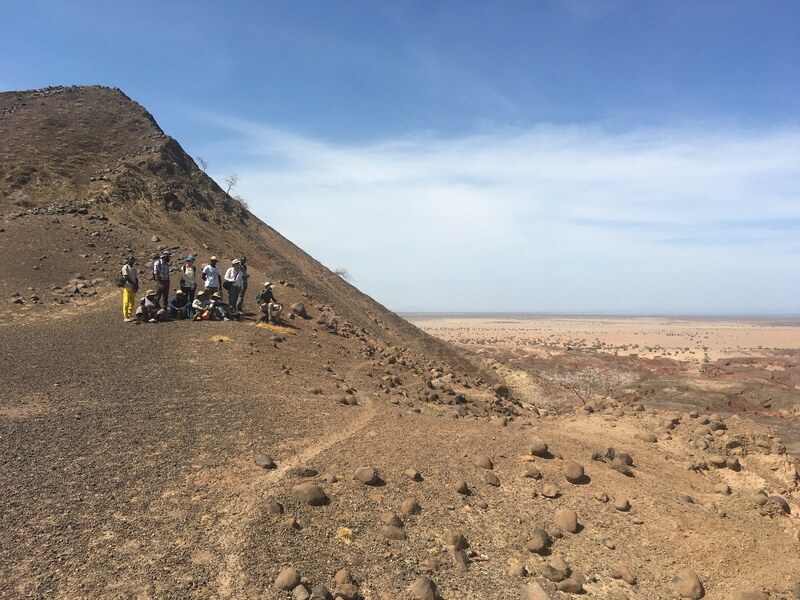 By analyzing different aspects of associated fauna from hominin sites, more can be learned about the environment in which these hominins were living, and how these environments changed over time. Dr. Lewis showed the students the fossil collections they will be working with, and demonstrated how the different groups will obtain their data from these teeth. In the coming days, the students will be collecting data for their different research questions. 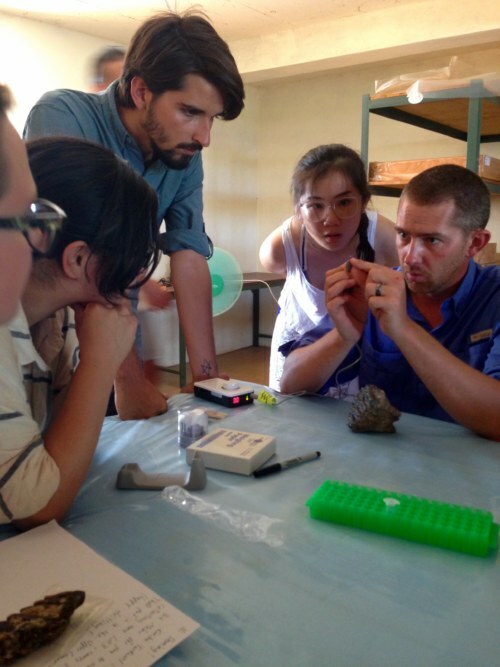 Dr. Jason Lewis walks the students through the different faunal assemblages they will analyze in the coming days (photo credit: Dorien de Vries). Dr. Jason Lewis demonstrates the drilling method for obtaining enamel samples for stable isotope analysis (photo credit: Dorien de Vries). 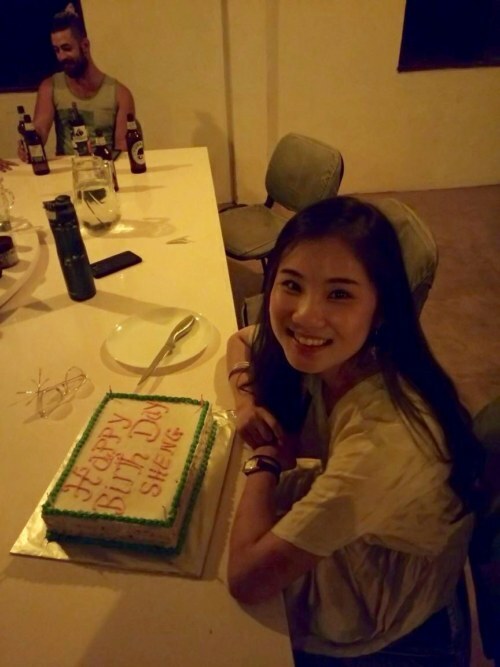 We also had another birthday at TBI: Sheng has turned 20! 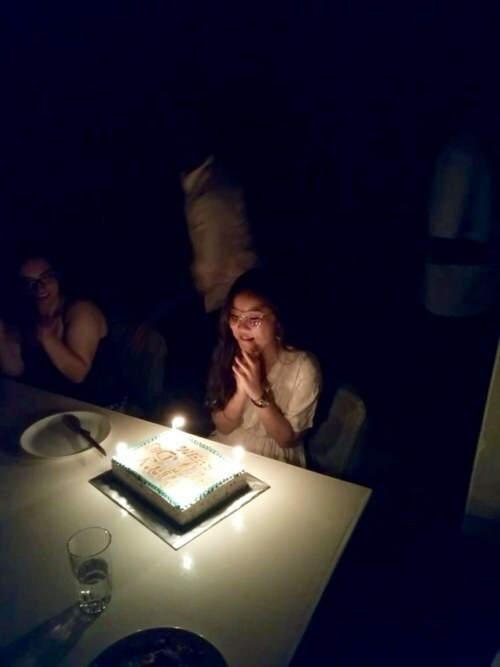 We all enjoyed a wonderful birthday cake after dinner on her birthday. 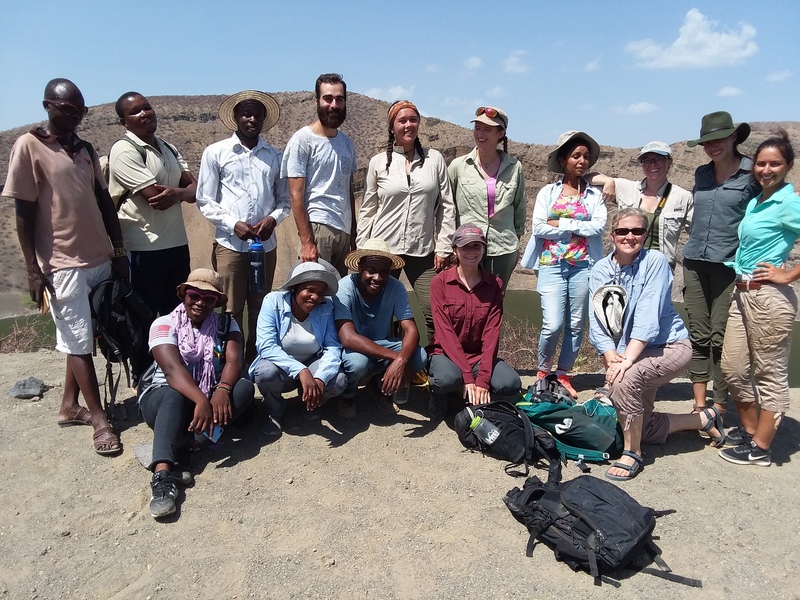 We love Sheng’s enthusiasm for wildlife and her sense of humor, and we’re so happy to celebrate her birthday with her here in Turkana.